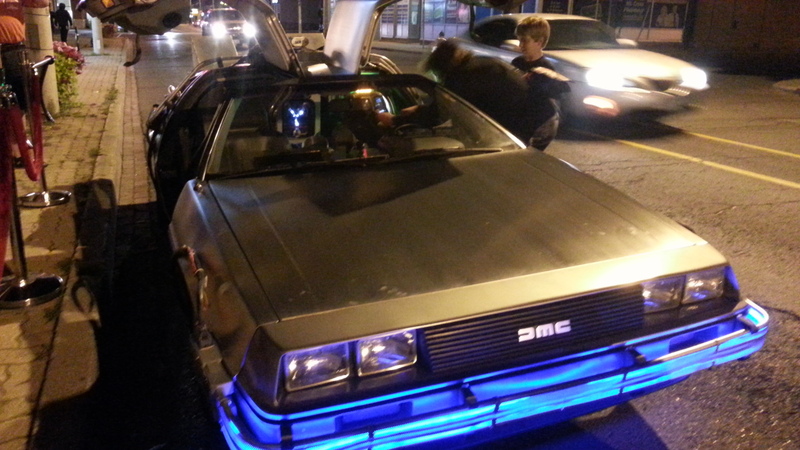 This past Friday, I hung out with time travellers at the Zoetic Theatre. 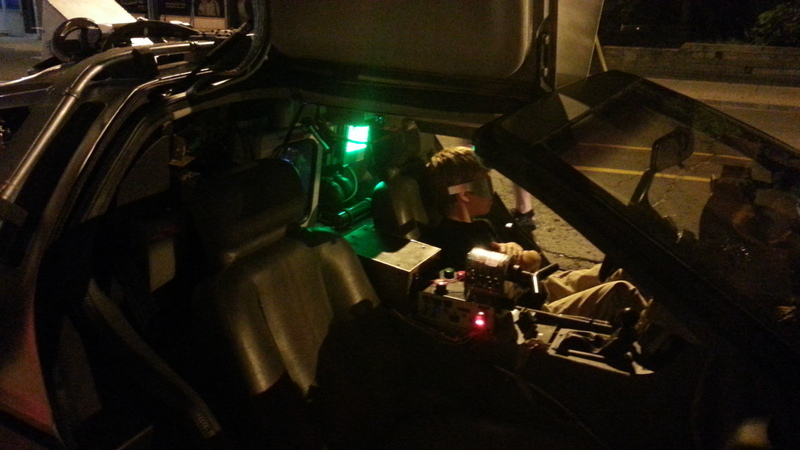 They had a DeLorian and everything. No, seriously, I have pictures. Now, I’m not an easy person to impress, and I’m definitely not one of those people who jumps around like a total fangirl at every movie prop or costume from a franchise I enjoy, but this one got me. First of all, look at that craftsmanship. Compare it to stills of Back to the Future. That took some serious time and effort. The thing even has a believable flux capacitor inside! 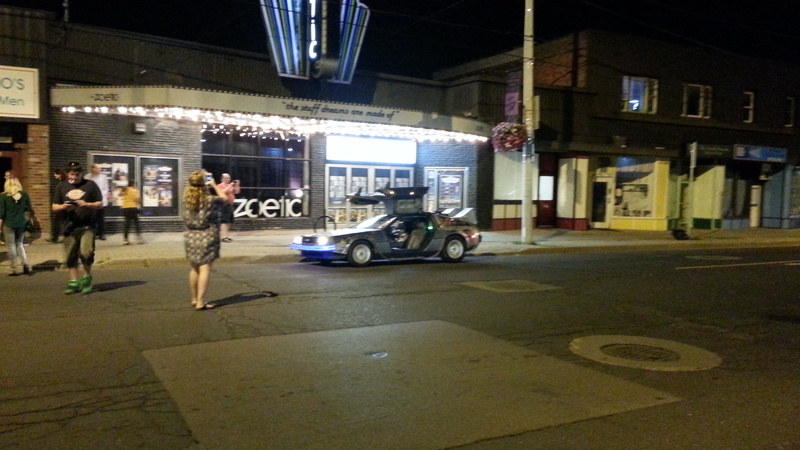 There’s nothing like driving around the corner of Upper Wentworth and Concession to see a DeLorian time machine, gull wings open, people flooding into the street to take pictures in the growing twilight under an old-fashioned movie theatre marquee… it was pure magic. The Zoetic Theatre’s classic movie nights are getting better and better, and people are flocking to the theatre to enjoy their old favourites. I know, I know, you’ve got the movie downloaded. You have it on DVD or Blu-Ray. Why pay $10 to go see an older movie at the theatre? There are a ton of reasons why these events are so much more fun than sitting at home, but since I’ve been there since the beginning of the series, perhaps the best way to explain would be to tell you all a bit about my experience with the Zoetic, and why it’s meant so much to my friends and I.
I first noticed the Zoetic when I was returning from one of my many walks to the park on the Jolley Cut. Since Robin and I are hopeless film fanatics, I was intrigued that something that looked like an old movie theatre was still hanging out in a strip mall in the year 2014. As I drew closer, I realized that it was an old movie theatre… one that we could walk to! A poster in the window advertised a screening of Raiders of the Lost Ark, which is a mutual favourite of ours. I was so excited that I power walked home, and told Robin that we were going. You see, being of that generation that worships eighties movies, but was just a smidge too young to see them in the theatre (I was an infant when Raiders and Back to the Future came out) I always kind of felt like I was missing out on something. DVD and Blu-ray, as nice as they are, just couldn’t make up for that experience of seeing these movies, for the first time on a big screen, and sharing that experience with a bunch of other people. The night came, and we walked down to the Zoetic, expecting to find your average, run-of-the-mill older movie theatre. Nope. This place is an architecture buff’s dream. Art deco mouldings. Tin ceilings. Old-fashioned ticket booths. Plus, they’ve done some really nice renos as well. The bathrooms are wonderful, done up in daring art deco style, and the ceiling in the lobby twinkles. Top it all off with a smattering of eccentric Victorian furniture, and it’s really quite the destination in and of itself. The screenings are distinctive too. Costumes are encouraged (and get you discounted tickets) and every film is preceded by a fun and immersive film history lesson and trivia contest. Our group has won sour patch kids and concert tickets so far, but we’re aiming for a new car, of course. The movie started. We cheered. We laughed. We… didn’t cry so much, but the sour patch kids might have gotten us halfway. Seeing Raiders on the big screen really put the film in a whole new light for me, and I started noticing details I hadn’t seen before. For instance, in the chase scene where Indy is hijacking the trucks, through the desert, why do they end up on a giant cliff all of a sudden which doesn’t appear to be anywhere later in the scene? And later in the movie, I noticed something cool, something shocking even, that I had missed every single time watching Raiders on VHS or DVD. In the scene where Indy is pointing the rocket launcher at the Ark, when Dr. Belloq does that monologue telling him he doesn’t have the guts to pull the trigger, the dude eats a fly in the middle of his monologue, and keeps going. Dude. Eats. A fly. Seriously, and they used that take! We were talking about it the whole way home. We often get a lot of flack from relatives for noticing these details in films. People take our attention to detail as a criticism of the films we love, but for film people, it is just the opposite. We love these films so much that we want to get up close to them, dissect them, and get other people close to them too. And that is precisely what we did. The next movie night, we showed The Wrath of Khan to my friend who is obsessed with the new Star Trek. The movie night after that, we took our twelve-year-old nephew to see Alien. At the end, when Ripley realizes that the alien is still in the escape shuttle, Robin and I peeked over at the little guy, and he was on the edge of his seat, eyes glued to the screen, so completely taken in by the story that he couldn’t see his Auntie Liz and Uncle Robbie exchange a knowing chuckle. Oh, and miracle of miracles, he actually looked up from his phone for a full minute to take in the twinkly ceiling. That’s the magic that the Zoetic has going on right now, and I urge anyone who wants to have an amazing night out with the family, with friends, on a very special date, to come out and experience these films the way they were meant to be seen. Come and get up close and personal with classic films, and the people who love them. Maybe you’ll notice something special too. Click above to see their upcoming film schedule! *Photos taken by Leonard Doxtator. I don’t know the people in these photos. If there are any photos of you in this post and you would like them taken down, please comment or email me at lizmclean.artist@gmail.com and I will gladly take them down. Or, if you like them, I can email you a copy. This past weekend, I did an appearance at Con Bravo at the Hamilton Convention Center. I had heard mixed reviews of the convention in previous years from other vendors, but this was my first year, and I had a blast! Two thumbs way, way up. I also tried a new format for my booth this con, choosing to join up with Ira Nayman, Karen Dales, Catherine Fitzsimmons and Stephen B. Pearl for a big, beautiful coalition table. We all really enjoyed this format, as far as I can tell, and it was a really fun weekend hanging out with my author peeps. Big thanks to Ashley, Greg and Dan, our power customers and dedicated readers who came and swept the table! That’s the spirit, guys! Overall, the feel of the con, and the general attitude of the people we met, was so great. I totally ran out of business cards, which, besides the obvious advantages, give me an opportunity to redesign! Yay, layout! Plus, I really appreciate how helpful the staff were. I left my phone at our booth overnight, then forgot my charge cable, and the people at registration totally had me covered. It’s great to see such a fun, growing fan event developing in the downtown Hamilton area. There really seemed to be a lot of buzz on the street about it when I was walking around. Next up, Milton Pirate Festival, which should be a really interesting new experience. In other news, over on the Pop Seagull Blog, we’re open to submissions! If you’ve got a short story or novel you think we might like, check out our guidelines. We’ve got a couple of anthologies in the works!